What separates group counseling from individual counseling? Home | Blog | Articles | How does group counseling differ from individual counseling? How does group counseling differ from individual counseling? Counseling is typically thought of as one-on-one encounters between a counselor and a client, which is a bit of a misconception. Group counseling structures are just as frequent a therapeutic setting as individual counseling sessions. They also represent an entirely different setting than individual therapy, requiring separate skills and knowledge. Students pursuing a graduate degree must become familiar with these essential differences, as group therapy is found in nearly all counseling fields and specialties, including family, mental health, marriage, substance abuse and school counseling. Group dynamics differ from individual therapy, and vary from group to group. In short, counselors need to call on a diverse set of abilities to best achieve outcomes for multiple clients. Honing these skills through a graduate education is one way counselors can better approach group settings. 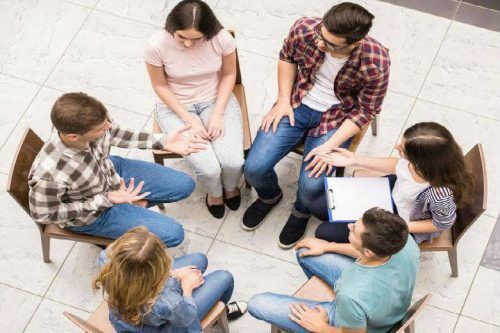 There are many benefits of group therapy, and deploying knowledge gained from a Master of Arts in Counseling can help counselors unlock those advantages for clients. Learn more about how group counseling and individual therapy compare, as well as how Bradley’s online MAC program can help prepare students. The differences between group counseling and individual therapy are clear. In individual counseling, there is one client and counselor. In group counseling there are multiple clients, and sometimes multiple counselors. Group counseling is roughly defined as at least five clients, and as high as 15. Sometimes in those higher reaches two or more counselors are employed to direct the session. Yet couples counseling is also a form of group therapy. This obvious difference leads to a variance in how sessions unfold, in the content of the conversations, and in how bonds and alliances between clients and counselors are formed. For instance, the one-on-one context of individual therapy may lead to more sensitive topics and personal feelings being addressed than in a group setting. However, that doesn’t mean intimate topics are not discussed in group counseling. Participants in a substance abuse group may all speak to their addiction struggles, but each in their own way. This affects the session, how it progresses and what insights are reached. Also, group counseling sessions are more likely to have specific purposes. While an individual session can be wide-ranging, group therapy is often focused on one topic that unites clients: for example, depression, eating disorders, terminal diagnoses, academic challenges, substance abuse or chronic pain. While it’s hard to ascribe an advantage to either style of counseling, there are certain situations and contexts in which group counseling is useful or necessary. The group forum enables different modes of interaction, expression and self-exploration that can improve the counseling experience. Feeling heard: Mental health issues and other struggles can seem like intensely singular experiences, which make them all the more difficult for clients to deal with and manage. Yet in group counseling these clients can meet other individuals who have gone through similar events and have felt many of the same things. In talking to and learning from one another, clients can form a better understanding of their own problems, as well as find strategies that work for others. Built-in support network: Having a support network is important to recovery and other mental health needs for clients in counseling. Building that network can be a challenge in some respects, but with group counseling, clients have access to a ready-made support network. Members of groups that meet regularly become invested in each other. Group counseling allows clients to act in supportive roles for their peers, cultivating strong bonds. Different perspectives: The marketplace of ideas theory says that better results come from more free voices. This sentiment can be found in group counseling, which lifts the voices of many for the good of all. Clients can benefit from hearing different points of view in their sessions, enabling them to be turned on to different ways of thinking about or tackling their issues. Learning from fellow clients is a valuable experience, one that is facilitated by group counseling. Running a group session demands specialized skills. Managing multiple personalities in counseling settings means that counselors must have sharp interpersonal skills. While abilities like communication, listening and empathy are important for individual therapy, they’re of greater consequence in directing and leading a group conversation. Counselors must also be able to resolve conflict and help clients understand each other, responsibilities not often found in individual therapy. Confidentiality and ethics is another subject that’s not unique to group counseling, but magnified in its context. What is said in individual sessions is under strict control, but while those protections extend to group sessions, they may not be as rigid. In some cases these codes are broken. Thus, engendering trust and encouraging honesty is a central duty of the counselor to avoid such instances. Students in Bradley’s online MAC program take ENC 625 “Principles of Group Counseling,” which helps prepare them for the realities of group therapy. In the course, group theory, practices and methods are explained. Students participate in experiential learning by leading and participating in supervised group sessions. This course is just one part of a robust curriculum aimed at preparing students for all possibilities and opportunities in group counseling. Contact an enrollment advisor today for more information about the online MAC program at Bradley University. What is an online Master of Arts in Counseling program? Learn more about Bradley’s online degree programs. Bradley Ranked Among Nation’s Best Universities – The Princeton Review: The Best 384 Colleges (2019). Only 15% of all four-year colleges receive this distinction each year, and Bradley has regularly been included on the list. Bradley University has been named a Military Friendly School – a designation honoring the top 20% of colleges, universities and trade schools nationwide that are doing the most to embrace U.S. military service members, veterans and spouses to ensure their success as students. Bradley University is regionally accredited by the Higher Learning Commission. The Higher Learning Commission (HLC) is recognized by the U.S. Department of Education and the Council on Higher Education Accreditation. The Master’s Degree Program in nursing, Post-Graduate APRN Certificate Program, and the Doctor of Nursing Practice Program are accredited by the Commission on Collegiate Nursing Education, 655 K Street NW, Washington DC 20001; (202)887-6791; http://www.ccneaccreditation.org.